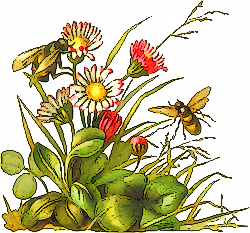 “Don’t-Step-on-a-Bee Day” was created by Thomas and Ruth Roy of Wellcat Herbs to remind kids during summer vacation not to step on a bee while going barefoot. The best way to keep from getting stung by bees is to avoid contact with them. Be careful when stopping to smell the flowers, in case there is a bee inside. If you are walking around outside in the summertime, keep your shoes on and don’t wear sweet-smelling perfume. Dress in long pants and a lightweight, long-sleeved shirt. Avoid bright-colored clothing and clothing with flowery prints. Cover food at picnics and don’t drink soda from open cans. Stay away from garbage cans that are swarming with bees. If a bee comes near you, don’t swat at it. This will only make the bee angry and upset, and it may sting. Just move slowly or stand still, and the bee will be more likely to move on. If you are chased by a swarm of bees, run in a zigzag pattern and seek shelter in a house or car. Do not jump into water! The bees will just wait around until you come up for air. This entry was posted in 500 Pure Science and tagged bees, holiday, insect, summer, zoology. Bookmark the permalink.